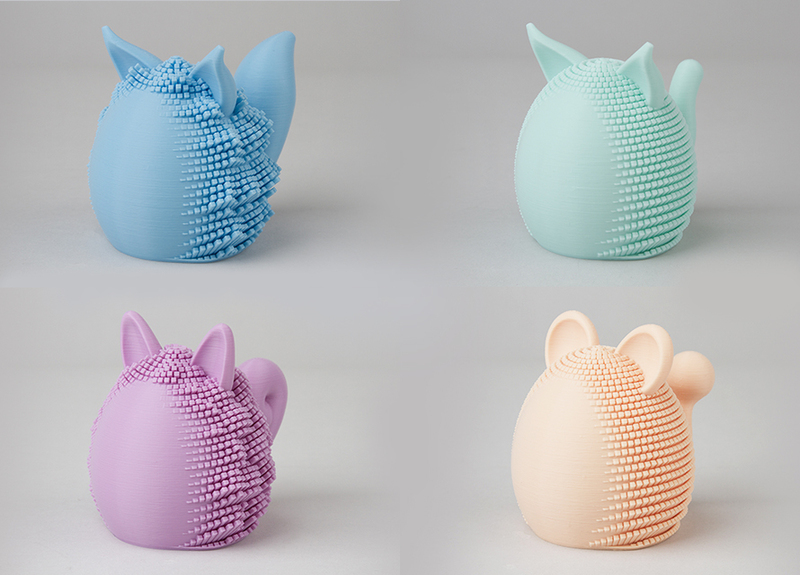 This tangible character series is a character that represents the personality or condition of a person in a combination of surface texture / ear / tail / body. The feeling of the surrounding surface of the character textures will help on the mental and physical stability. If you touch this character with your hands, it lowers your stress and stabilizes your mind. In Asia, this is called shiatsu. This digital texture is a size and spacing pattern that can be print from most FDM 3D printers. This texture has been verified using other designs such as Flow skin vase. This character represents each character in three elements. 1. The shape of the surface texture symoolizes the behavior pattern of the person who will receive it. The surface is uniform, symoolizes a person with a stable and regular behavior pattern. If the pattern is irregular, it represents something that likes a new challenge. 2. Ears and tails represent personality. If the tip of the ear and tail is sharp, personality is sensitive and can easily be hurt. On the other hand, if the ears and tails are rounded, it is a character whose personality is bad and forgetting bad memories. 3. Body shape indicates activity. If the lower part of the body is narrow and the upper part is wide, it can be said to be an active person who likes exercise. If the lower part of the body is wide and the upper part is narrow, it express a personality that likes activities with little movement, such as reading and watching movies. This character has a lid that can be rotated and opened and closed on the bottom so that you can put a little bit of candy inside. If you have someone who is similar in character to these characters, give it a try.